How Long Does It Take to Evict a Tenant for Breaking the Lease? Sometimes a tenant refuses to move out of a rental property, even after the landlord has given proper notice that he has broken the lease agreement. Landlords can pursue legal action to evict tenants, but they must follow the proper procedures according to California law. The eviction process moves fairly quickly, depending on how busy the courts are, because California courts give these cases a high priority. On average, the eviction process in California can take anywhere from 20 to 40 days. A landlord can serve several types of notices to tenants who have broken the lease agreement. A 30-day lease termination gives renters that long to vacate the property. A 3-day notice requests that tenants pay delinquent rent or correct the lease-breaking action within that time. If tenants fail to comply with either notice, the landlord has no choice but to proceed with legal action. The landlord files a complaint with the local court clerk, outlining the issues and the request for eviction proceedings. The complaint includes details about who is involved, which property, a description of the problems and copies of notices given to the tenant to date. The court delivers a copy of the filed complaint to the tenant, either by hand or by mail, within one to three days. Delays may occur if the tenant manages to avoid being served. The notice also requests that the tenant respond within five court days of receipt. The tenant only has five court days to file a response, which is a chance to address the landlord's complaint in writing with the court. 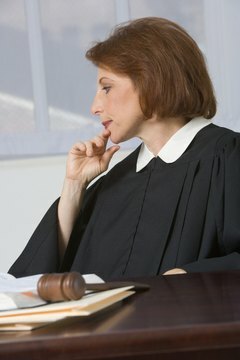 Once the tenant responds, the court sets a date for a hearing, usually within 10 to 20 days. If the tenant does not respond within five days, the court moves ahead with a default judgment in favor of the landlord. At the hearing, if the judge finds in favor of the landlord, she issues a "writ of possession" that gives the landlord all rights to the property again. The court also authorizes the county sheriff to evict the tenant. Once the sheriff receives the order, he posts a notice on the rental property and allows the tenant five days to vacate. If the tenant refuses to leave after five days, the sheriff returns to physically remove the tenant from the property. The landlord can enter the property after that and change locks, clear out any possessions or otherwise reclaim it. Marie, Jenna. "How Long Does It Take to Evict a Tenant for Breaking the Lease?" , https://legalbeagle.com/42381-long-evict-tenant-breaking-lease.html. Accessed 19 April 2019.